David Allen Green noted on Twitter that under ordinary circumstances, constitutional law is boring. During the 2011-2014 national discussion about Scottish independence, closed but not finished with by the 2014 independence referendum, the concept of having a codified Scottish constitution was given attention by many boring people, including myself. We argued that if Yes got the majority, a second Constitutional Convention, similar to that which eventually drafted what would become the Scotland Act in 1998, would be required. While this was one of the duller topics of the national conversation, the fact is it was one: there were meetings, workshops, Facebook groups, devoted to the topic of what a constitution for Scotland should look like, how it should be drafted, and how agreed to by the people of Scotland. Needless to say, no time at all was spent by the Leave campaigners in the years during which they were campaigning for the UK’s departure from the EU, on discussing how to resolve the UK’s constitutional settlement if that happened. The Brexiters were not really planning for Brexit: they were gazing wistfully at an imagined golden age, where chip shops didn’t sell pakora and funny foreigners didn’t keep moving in with their unEnglish languages and unEnglish names. David Cameron may or may not have been aware of the problems that the UK leaving the EU would cause for the British constitution, but as we know, his plan for Brexit was to hope it didn’t happen and to run like a spineless rat when he realised he’d lost. I’ve seen no indication that either Theresa May or David Davies, Brexit minister, ever realised there was going to be any issue with the UK constitution at all. After all, since the UK’s constitution is uncodified, that means it’s flexible and can be amended by the UK Parliament. But, to begin with: the Good Friday Agreement is part of the UK’s constitutional settlement with regard to Northern Ireland and the Republic of Ireland. The GFA specifies a completely transparent border between the Republic and Northern Ireland. The GFA was ratified by two referendums, held on the same day, in Northern Ireland and in the Republic. In Northern Ireland, the referendum was purely for the people of Northern Ireland to ratify the deal: the Good Friday Agreement then became part of the UK’s uncodified constitution. In the Republic of Ireland, the referendum was to change their constitution. The Good Friday Agreement then became part of the Republic of Ireland’s codified constitution, which cannot be changed except by a referendum. The recorded Yes vote was 94.39% – 1,442,583 people voting in favour, only 85,748 voting against. I’ve discussed in a previous blog how Theresa May’s government, requiring the support of the DUP on one leg and the hard-Brexiters on another leg is inherently unstable: and the Tory MPs who might otherwise be trying to stop a hard Brexit are too busy keeping the Tory government propped up between two unreconcilable forces. By the way, the entire Cabinet is once again summoned to Chequers for the weekend 5th/6th July, to again try to work out some compromise that the DUP, the hard-Brexiters, and the EU-27 negotiation team, will all find acceptable, before the looming Friday 28th September deadline. I would hope and trust that the reality that any deal they propose among themselves has to keep the Good Friday Agreement intact will at least be discussed. What will not be discussed, I anticipate, is the problem of the Scottish constitutional settlement. The 1707 Acts of Union are also part of the UK’s uncodified constitution; as is the 1998 Scotland Act, that re-created the Scottish Parliament after a gap of two centuries. As part of the constitutional settlement in 1998, the UK Parliament at Westminster must ask for and get the Scottish Parliament’s approval of legislation affecting the devolved powers of Scotland: the EU Withdrawal Act, which received Royal Assent this week, claims powers which were with the EU, which should be devolved to Scotland, are now reserved to Westminster, and will be until the UK Government sees fit to follow the UK Constitution. The Scottish Parliament voted on the EU Withdrawal Bill and declined to approve it. In order to get their EU Withdrawal Bill to Royal Assent, the UK government has had to override or ignore the Scottish constitutional settlement. Importantly: the majority party of Scottish MPs is pro-Remain: Scotland voted Remain by a large majority: the Better Together campaign for the 2014 referendum laid great stress on the point that if Scotland left the UK, it also left the EU, as rUK, not iScotland, would be the successor state. 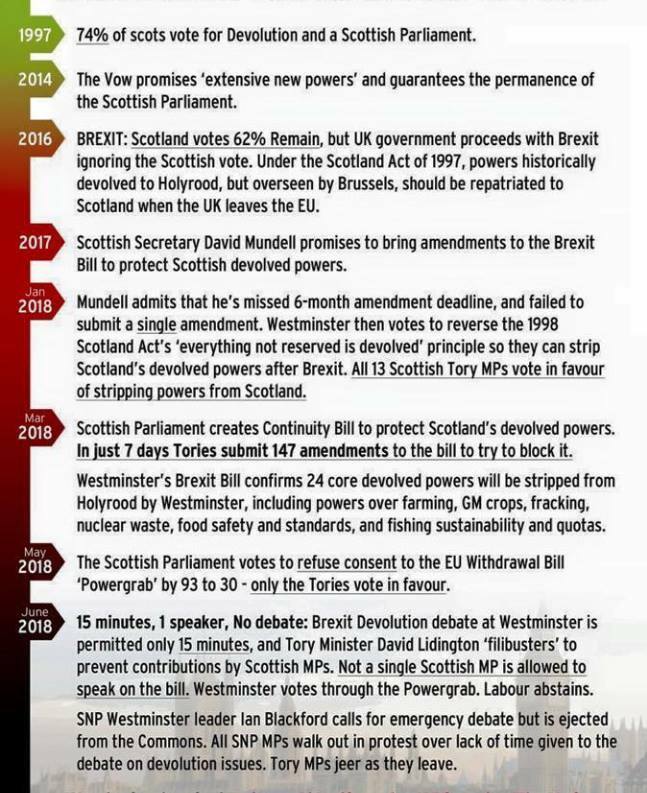 But when the EU Withdrawal Bill came to the point where Holyrood’s right to the devolved powers that had been with the EU and would be returned to the UK post-Brexit, was to be debated: the only MP allowed to speak for the alloted 15 minutes was English. Holyrood had voted by majority not to give consent to the EU Withdrawal Bill, as required by the constitutional settlement in the Scotland Act – every MSP except the Tories voting to uphold the principle of Scottish devolution – but the Conservative/DUP government at Westminster simply ignored that refusal of consent, and the EU Withdrawal Act 2018 is now the law of the land. I think it horrifyingly likely that at 11pm 29th March 2019 the UK will crash out of the EU in hard Brexit. I’ve said why in a previous blog. When that happens, trouble will begin in Northern Ireland – that’s all too likely. But trouble will also begin in Scotland. Parts of Scotland will be among the worst-hit, first-hit, by the food and medicine shortages of hard Brexit. This isn’t what we voted for: this isn’t what the Scottish Parliament consented to: this is being done to us by Westminster, by a Tory government we didn’t vote for, and I think the resistance to Tory rule sparked by the poll tax is going to be nothing compared to the resistance sparked by Brexit. If the UK leaves the EU – even with a deal, a backstop terminating on 31st December 2020 – it’s no longer a question of if there will be another Scottish independence referendum: just when. If there is a deal, if civil society is maintained, then I think the next Scottish Parliament elections in May 2021 will have the SNP and the Scottish Greens both with a second referendum for independence in their manifestos, and I think Holyrood will have, again, another SNP/Green majority and the First Minister a democratic mandate to hold a second independence referendum – given the lengthy requirements of Scottish legislation, that will be in 2023. iScotland can be fast-tracked back into EU membership (we already fulfil most of the chapters of the acquis) by 2029, if we want. If there is no deal, if there is hard Brexit, then there may well be a referendum much sooner, or in total breakdown, Holyrood might take the step of declaring Scotland independent without a referendum – why not? In the civic collapse of the UK, would there be anything to lose? Well, yes: The Ministry of Defence would have something to lose. The UK’s nuclear submarine base is in Scotland. It’s the only deep-water naval base for nuclear vessels in the UK, and to build a new one would take ten years and more money than the UK’s got, especially after Brexit. Nor will the UK government any longer have friendly EU allies and neighbours who might let UK subs use their naval bases. At that point – if iScotland declares independence, and Northern Ireland is in turmoil – the UK military will be overstretched: they must defend their nuclear submarine base against Scottish independence: they must prevent actual street fighting and bombing in Northern Ireland: they are also committed to airlifts of essential supplies to parts of the UK that will be dying without them. Hard Brexit means the break-up of the UK, either by civil means – I hope – or at worst by foul: I no more than you want to see soldiers inside Holyrood preventing MSPs from voting on a referendum bill at gunpoint. Could that happen? How desperate would the UK government be to try to quell civic rebellion in Scotland by armed force? How desperate could Brexit make the UK government? I hate to sound apocalyptic. But if you have a Tory MP, go see them at their next surgery and tell them: better to topple May’s government than risk hard Brexit. Let’s be boring about this. Please.